The world calls them ‘French fries’. Nothing hurts us Belgians more than giving the French credit for fries. 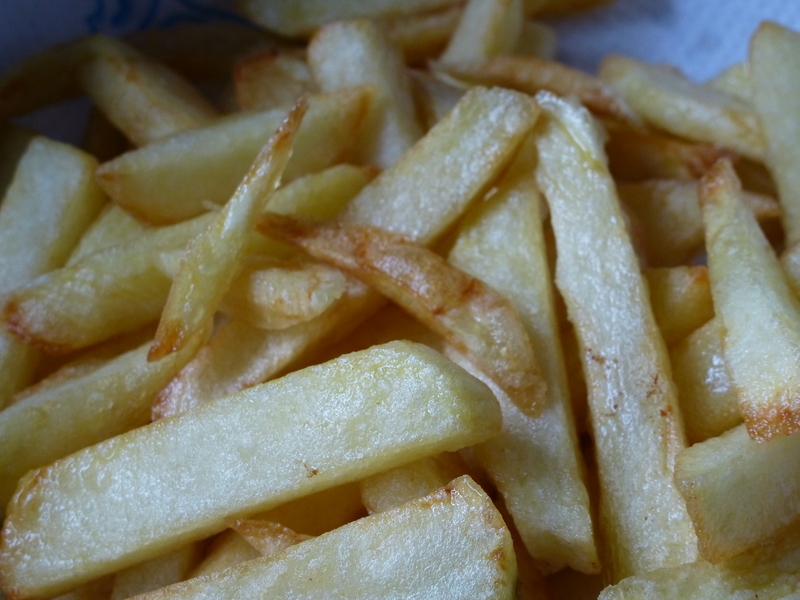 It is common knowledge here in the low countries that the people who make fries best and have friet stalls (frietkot, frieture, frieterie) on street corners are the Belgians. By the way, if you ever come to Belgium, treat yourself on a ‘pakje frieten’ (pack of fries) ‘with mayonnaise in a ‘frietkot’. The secret for good fries lies in the recipe. Even though you would think it just a matter of cutting up potatoes and frying them, the real ‘friet’ is cooked with patience. It is fried not once, but twice. This is a simple one. The only thing you need are potatoes and oil. You have to choose your potatoes wisely. If you can’t find potatoes for fries, select large potatoes which are very flowery (have a lot of starch). For the oil we personally prefer vegetable oil. Select oil which can stand high heat like peanut oil. Peel the potatoes and cut them in fries. Our local fries are only 1 cm thick. You can choose to wash and dry the potato before you cut them. Or you can peel and cut, and then wash and dry the fries with a kitchen towel. Pre heat the frying pan up to 150-160° C. Fry the fries at this temperature until they are cooked but not crispy and brown. Check if the fries are cooked by squeezing them. They have to be just smash able. Make sure not to overcook them at this time, otherwise your fries will get very dry. 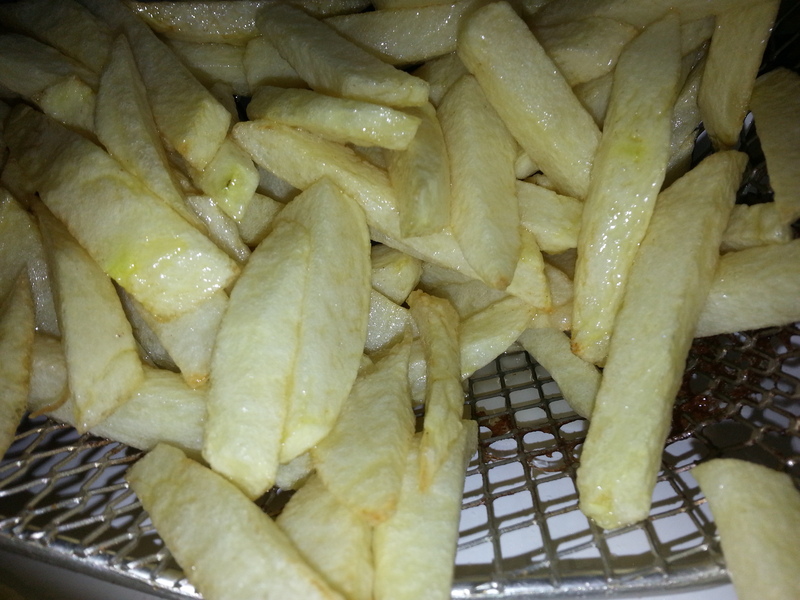 Take the fries out of the frying basket and let them cool down. Just before you want to serve, fry the fries for a second time at 170-180° C. This is a very fast process, don’t walk away. Always make sure your frying fat is preheated before you drop them in, and use small quantities otherwise your fat cools down and you don’t have control over the temperature anymore. Shake the basket in the beginning, so that the fries don’t stick. Your fries will turn brown. Cook them as dark as you wish. You can actually hear a sizzling sound appear when they are done. When your fries start singing, then they are ready. Please sprinkle with salt and preferably serve with freshly made mayonnaise. How to make the mayonaise? A topic for future blog time perhaps? This entry was posted in Belgian Classics and tagged Belgium, French fries, Fry, Peanut oil, Potato, Potatoes by petratant. Bookmark the permalink.